Daytonian in Manhattan: Ernest Flagg's 1903 "Little Singer Building"
When Isaac Singer died in 1875 he left a fortune of $14 million, most of it gained through his Singer Sewing Machine Company. Although Singer did not invent the machine, and despite his numerous other inventions and improvements on other inventor’s ideas, his remarkable marketing – a housewife could take home a machine for a down payment of $5.00 and start sewing that same day – resulted in a hugely successful business. 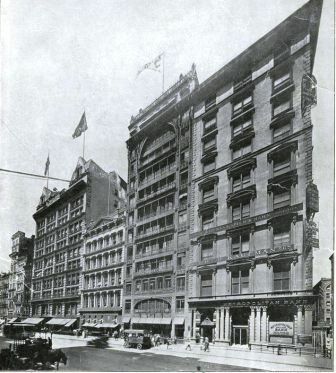 In 1896 Frederick Bourne, president of the company, hired Brooklyn-born architect Ernest Flagg to design a new headquarters at Broadway and Liberty Streets. Six years later the booming Singer Company had outgrown the building and Flagg was brought in again to design a new structure. The site chosen was at 561 Broadway where Henry Wood’s Marble Hall Theatre stood – a 2000 seat theatre where popular minstrel shows were staged. A second plot at 88 Prince Street was acquired accommodating an L-shaped building with entrances on both streets and preserving the classic 1860 white marble Black and Ball Jewelers building on the corner. Trained in Paris, Flagg was known for his use of avant-garde materials, his interest in natural light and healthful ventilation and his unconventional treatment of the Beaux Arts style. This all came together in the Singer Sewing Machine Building when ground was broken in 1902. 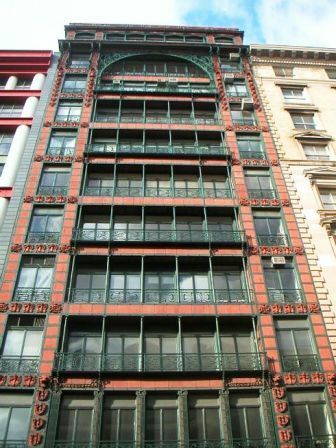 Using a rusty-red and green color scheme, he combined red brick, cast iron and wrought iron, expanses of glass and terra cotta detailing. The architect’s creation is at once whimsical and elegant. By recessing the windows, he allowed for row after row of lacy cast iron balconies which at a glance appear to be identical yet each has subtle differences. 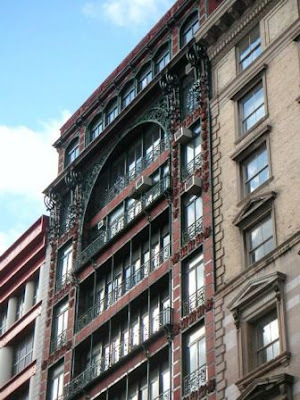 Surmounting the soaring recessed bay of windows is an elaborate wrought iron arch; a similar one appears on the second floor. The ornate cornice is supported by decorative, scrolled iron brackets, reminiscent of those found on Flagg’s earlier Mill’s House on Bleecker Street. On every floor the broad expanse of glass allowed bright light to pour into the factory space and offices. By exposing structural steel and iron as part of the overall design, Flagg was pioneering architectural trends. While in Paris he embraced the forward-thinking ideas of Viollet-de-Duc, called the father of modern architecture. Viollet-de-Duc urged the use of fresh materials, such as cast iron and glass, and espoused exposing functional elements as design components. The Prince Street façade mimics the Broadway façade with just a little less enthusiasm. 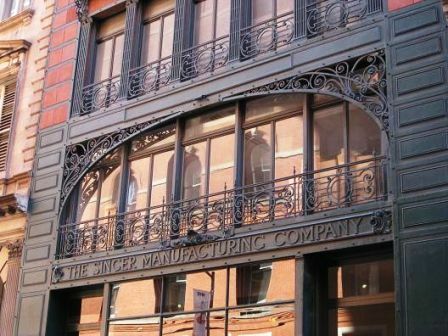 In the decorative iron work of the second floor “The Singer Manufacturing Company” survives. 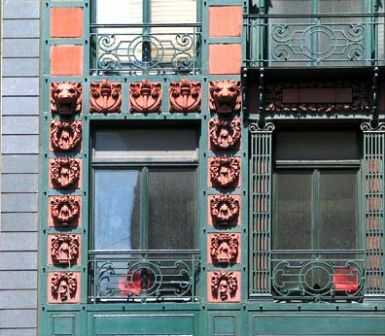 As its Broadway neighborhood encountered a renaissance towards the end of the 20th Century, with trendy boutiques lining the streets and celebrities moving into now-pricey loft spaces, The Little Singer Building was converted to residential and commercial co-op space. Headed by Bone/Levine Architects, a full-scale restoration took place. The original Flagg colors were restored, much of the original iron lattice system was removed in order to repair the steel frame which, along with the terra cotta cladding were then re-assembled. Where missing wrought iron components were missing or damaged beyond repair, replacements were made. Perhaps most noticeable and welcomed was the Richard Levine’s 2008 installation of the glass and iron sidewalk canopy along the Broadway side, copied from records and photographs of the original which had long ago disappeared.